Mr. Patrick “Pat” Lloyd Lynch, age 96 years, passed away peacefully on Thursday, April 5, 2018 in Roseview Manor. Pat was born on July, 10, 1921 in Nipawin, Saskatchewan. 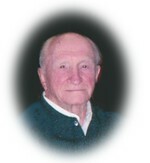 He served in the military during World War II. He met Evelyn in 1946, and they were married the following year. Pat and Evelyn were blessed with two lovely children, Leslie and Jim and a beautiful granddaughter, Jennifer. Pat loved all sports, especially hockey, baseball and golf. He loved to talk and made friends everywhere he went. He was employed by CIBC for over 50 years and Capital Insurance. Pat is survived by his loving wife, Evelyn; daughter, Leslie (Clyde) Riles; son, Jim (Edel) Lynch; granddaughter Jennifer Riles; sister, Kathleen (John) Law and numerous nieces and nephews. Predeceased by his parents, Patrick and Audrey Lynch. Funeral Services for Mr. Patrick Lynch will be held on Tuesday, April 10, 2018 at 2:00pm in the EVEREST FUNERAL CHAPEL, 299 Waverley Street at Algoma officiated by Fr. Ciaran Donnelly. In lieu of flowers, donations may be made to the Thunder Bay and District Humane Society, Alzheimer Society or a charity of your choice. Thank you to the staff of Roseview Manor for the exceptional care and compassion shown to Pat during his time there.